Keep your drinks cold or simply use to store ice for your snow cones! This 150 quart cooler can hold up to 250 cans at a time. It will even hold 2 liter soda bottles standing upright. Note - cooler is NOT on wheels. 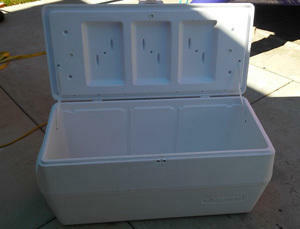 150 quart, extra large capacity white cooler measures approximately 30x45x19 inches.